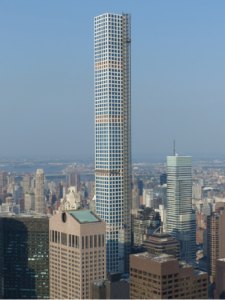 432 Park Avenue and Billionaire's Row | Custom & Private New York Tours, Inc.
93 feet wide on each side this 1,396 foot tall building’s roof is currently the tallest edifice in New York City, if you discount the 408’ pole atop the One World Trade building. Incredibly, the Uruguayan architect, Rafael Vinoly’s design was inspired by a 1905 trash can! Currently there are several buildings under construction in the immediate area known as Billionaire’s Row (the 57th Street corridor) that will exceed the roof height of 432 Park. Ten of 432 Park Avenues floors remain empty except for housing the elevator shafts and mechanical necessities. Harry B. Macklow, the builder, paid $400 million for the Drake hotel and he quickly demolished it to make room for this record breaker. Looks like a winner! Way to go New York!